During the day before I saw the premiere of David Fincher’s The Social Network, I ended up not having my phone. I was disconnected from the world: No Internet, no Twitter, no texting, and certainly not Facebook. And on the verge of sounding cliché, I did in fact start to notice the details around me: the sounds of the subway car, the subtle choices in architecture, and the smiles of the people around me. Being disconnected was a way of connecting, and although its become a trite argument against the nerds like myself that write on a computer and rarely make it out into the sun, it’s the driving force behind The Social Network, and the film brilliantly displays that. Yet before I jump into a long rant on the joys and wonders of the new David Fincher film, which has been written on earlier (and better) by many other critics, I’d rather focus on my stray observations on the film, which I find more illuminating that a particularly standard review. Yes, it’s a masterpiece—so let’s move on beyond that and find the real choices that make that happen. But to basics first: Mr. Fincher, known for films that are much more visually dynamic such as Se7en and Zodiac, directs this film written by West Wing scribe Aaron Sorkin, who has one of the best constructed scripts, scene for scene, put together here. A lot of it isn’t probably true, but I don’t believe we are supposed to see it fact for fact, but as a story of a culture. It’s 2003, and young Mark Zuckerberg (Jesse Eisenberg, outstanding), is a programming student at Harvard. He’s just broke up with his girlfriend (Rooney Mara, soon to be sporting a Dragon Tattoo with Mr. Fincher), and decides to quickly create a scandalous Internet site in retaliation, which gets him some spite as well as attention. Soon enough, Zuckerberg is propositioned with an idea of connecting the students of Harvard together, but decides to take it further. With the help of his best friend Eduardo Saverin (Andrew Garfield) starts thefacebook.com, and it’s an instant hit. But whose idea is it? The film flashes from location to location, as well as through temporal space to a pair of depositions, where people fight Mark not only for his money, but to strip him of his pride. Yet does Mark care about this fight? Or even the money that made him a billionaire? The Social Network has been compared to Citizen Kane, The Great Gatsby, and other titanic cultural works that display great obsessive men, yet there are some differences that define Zuckerberg, especially at the mile-a-minute speech Mr. Eisenberg gives him (Mr. Sorkin’s script stands at 160 pages, yet Mr. Fincher squeezes it into a two hour film). Early in the film, Mark discusses the idea of fashion and how it’s changing, always evolving, and thus always lucrative. Its interesting how the film approaches the subject that is under scrutiny, almost like an organism that has been genetically engineered, unsure of how to treat it. 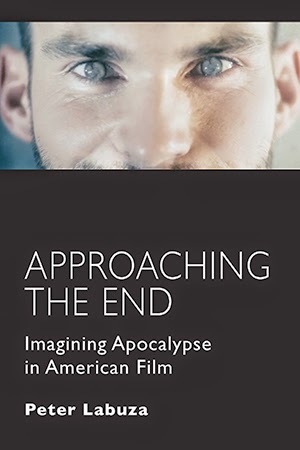 Sean Parker (played by Justin Timberlake) tells Mark, “We don’t know what it is except we know its cool.” That statement rings out like a motto of the 2000s, not to have to throw the word “zeitgeist” on this film, as one inevitably must. In the age of the Internet, we don’t understand the objects we have, their meaning, their application, but simply their cultural worth, and understand that means something. Visually, some have commented on Fincher’s restrained style here, yet in many ways, his compositions and editing structure have never been better. After that dire first scene, Mark runs along campus, and we get some of the very few exterior shots of the film—we get the world of Harvard as it stands. As the film continues, we are given no establishing shots and simply interior spaces, as if the universe is slowly folding over, and the disparate spaces that leave people so distant, are closed away. Mr. Fincher’s focus on windows and glass leave that idea hanging, the actual frames that separate us, and how transparent those have become. Instead of giving us space, Mr. Fincher simply cuts between spaces as if he were shooting them in the same room, using simple directorial cues to act as if these spaces blend together. The dark, dreary, and drab lighting scheme, as well as the often-frightening score by Trent Reznor, give this film its alienating atmosphere, in which what matters is not how we connect, but the fact that we connect, and that we’re able to do it as much as we want. A very few sequences don’t exactly work. In a strange joke, Mr. Fincher films a crew race in the United Kingdom in extreme high definition, in what reminds me of the classic work of Mr. Sorkin’s attempts at parody (the brutal Charlie Wilson’s War had one as well). Another one, a late sequence between Mr. Garfield and his soon-to-be-ex-girlfriend, spells out the themes and ideas of the film a little too obvious, especially for a film that is so subtle. 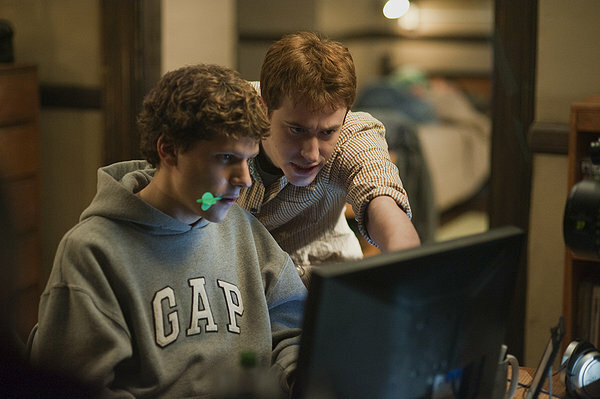 The final shot of The Social Network, showing Mark hitting refresh over and over, is one that grounds the film in its human emotion, which Mr. Eisenberg displays with such reserved audacity. It is quite brutal to see a man who just wants to be recognized by a few individuals, but does so by building an empire. Genius is often led by madness, and as Mr. Fincher and Mr. Sorkin see it, and it’s often an accident led by an emotion more than an idea. 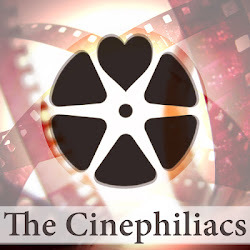 The film seems to comment that instead of confronting our issues, society has made it easy for us to instead run behind a veil and assert our fears and desires so passively, without any idea of consequence. Mr. Timberlake screams that “This is our time,” and that emotion reverberates throughout The Social Network, but I think it’s a message of fear for what we can become, more than what we’ve accomplished.